On TV in Japan, Part 1 | This Japanese Life. ← On Teaching English as an Out of Body Experience | 英語は儚いです. Posted on October 25, 2010	by E.
The TV show started out as some sort of dog melodrama. There’s a really adorable grandmother scooping up a new, tiny dog with gigantic eyes and hugging it with a face so filled with love that the cameraman shows it for a full minute. The date is typed on the screen with the sound of machine gun fire. Scene: The dog comes into the house. Grandma scoops it up, her face full of love, but then: The gnashing of teeth. The dog has bitten the woman’s ear. It’s bleeding, says her son. “Ie, ie,” says the grandmother – it’s nothing! She loves that dog. Machine gun fire shows the date. It’s the next day. Grandmother is coughing, struggling to walk with her friends. She dismisses her illness. Machine gun fire. Three days later. A concerned daughter stares as grandmother shakes a thermometer. Later that night, two women in kimonos scream at grandmother as she’s passed out on the floor. Machine gun fire. She’s in the hospital. Her face is purple. A doctor draws blood. Microscopic disease fills the screen, superimposed over adorable dogs and a single tabby cat. The music becomes cinematic, orchestral. A scientist stares through a telescope. Behind him, a doctor shakes his head. A corgi is chewing a bone. The grandmother is lying in a hospital bed. The music intensifies. A cat paws at a camera. Images: The gnashing of nippy dog teeth. Blood on the ear. A computer animated infection. The music swells to a frenzy. The disease has infected her brain. Back. All the same stuff happens, but faster. Old lady is making tea now. A poodle in a pink shirt. Another dog with a bow. TWIST: This is a TALK SHOW. A freeze-frame dissolves to show a host on stage with 5 people and their tiny dogs. Now, out of a shiny pod, a man in a suit emerges. The Kanji for “Old River” is shown. He’s a veterinarian! TWIST 2: This is a GAME SHOW. The veterinarian answers questions that the five tiny dog people have guessed on, probably about a half an hour ago. He answers the questions, then the dog people’s answers are revealed. Are they the right answers? I don’t know! The answers come from a close up of a dog and a thought bubble. Some Kanji comes up, and everyone cheers. Answer: No, do not kiss your stupid dog on the mouth, because you will get a horrible debilitating disease. Is your shaved Corgi in a raincoat sleeping in your bed at night? Too bad, now you’ve got spinal meningitis. Also, if your golden retriever keeps drawing blood when it bites you, stop fussing with it and send it away. Round up of how many points everyone has. 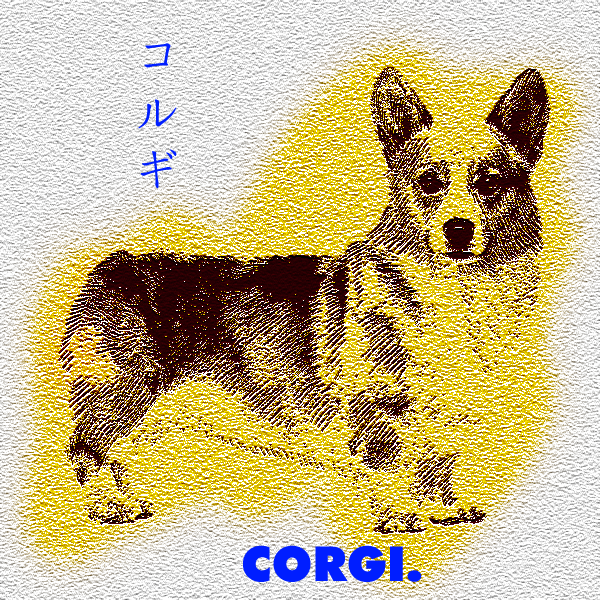 For obvious reasons a Corgi’s head is superimposed on all of them and then a burst of flame covers the screen. Now it’s all about training a basset hound to stop drooling, which is too disgusting for me to watch. *= When the news talks about a monkey attack, which is about once a week, it’s usually mentioned throughout the program but then only shown at the end of the show, in a kind of Kyushu-wide recap of events set to soothing electronic music. In my experience, the footage they show is B-roll of the same monkeys running around on rooftops. I suspect that new video of a monkey attack would get higher play on the Japanese news pyramid. This entry was posted in Culture Shock, Weird. Bookmark the permalink. Also, this show sounds amazing. How decent is your language comprehension for what information gets through vs. what you interpret from the images? Keep posting, Eryk. I know I’m intrigued. Holy cow, I don’t know how I missed this post earlier. You need to get on part 2, stat.